It did not look like one of President Trump’s most enthusiastic greetings, but the US leader has had his first meeting with the Philippines President ahead of an ASEAN summit in Manila. Both men are controversial and maverick heads of state, with Rodrigo Duterte often described as the “Donald Trump of Asia”. 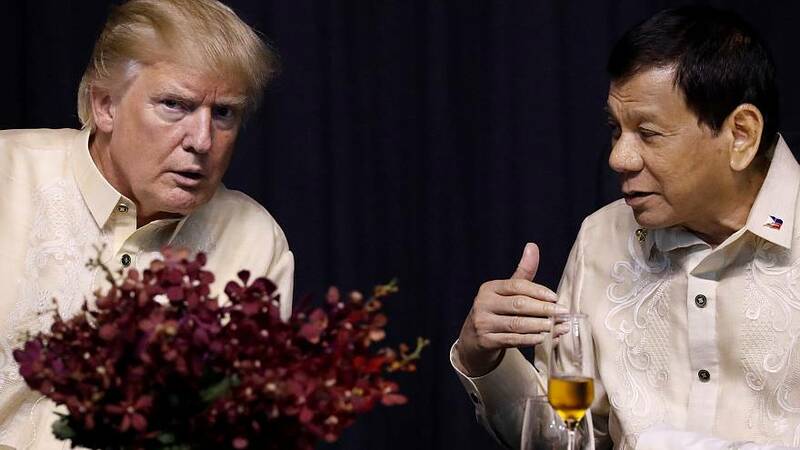 The US leader is under pressure to raise the issue of human rights with Duterte, accused of overseeing extrajudicial killings in his war on drugs. North Korea was also expected to be a big talking point at the summit … but a presidential Tweet once again stole the headlines on the eve of the two-day summit. “Why would Kim Jong-un insult me by calling me ‘old’, when I would never call him ‘short and fat?’ said Trump’s Tweet. “I try so hard to be his friend,” he added. At the same time Trump offered to mediate in the South China Sea dispute between numerous countries. Big protests have greeted Trump in Manila, with a massive security operation in place. Protesters are being kept well away from the summit venue. Trade issues are also expected to top the agenda. ASEAN has a policy of not interfering in internal affairs of member states, but meetings on the sidelines of the summit are expected to raise the thornier issues in the region.